Are healthy diets really more expensive? While there is a public perception that healthy foods are expensive, despite several studies it is not clear whether healthy dietary patterns really cost more than less healthy diets. Generally, the more people spend on food, the healthier their diet. Research has shown that low-income groups are at much greater risk of poor diet because, although they spend less per person on food, they spend a greater proportion of their income on food. In Australia, a healthy diet costs lowest-income families between 28% and 40% of their disposable income while a healthy diet only costs average-income families around 20% of their disposable income. Although basic healthy foods don’t incur GST in Australia, the cost of healthy food has increased more rapidly than that of unhealthy food in Australia over the past 15 years. While we know some information about food affordability in Australia, there is a lack of real-life data to inform relevant debates about fiscal policy from a health and diet perspective in Australia. There are no nationally standardised tools or protocols to benchmark, compare and monitor food prices and affordability. While jurisdictions and research groups have used different food baskets as survey instruments, none is entirely consistent with current Australian Dietary Guidelines nor accurately reflects the current Australian diet. There are more than six different methods used throughout Australia to determine the cost of food from a health perspective but the tools that are generally used include healthier items abut also some unhealthy items, such as sugar and sausages. Determined the impact of factors that might influence the cost and affordability of different diets. This project developed the first nationally standardised tools and protocols to determine the relative price and affordability of healthy and unhealthy (current) diets. 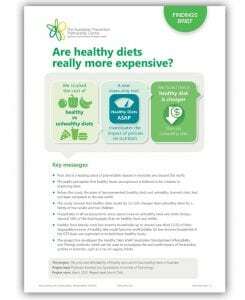 The new approach is now called the Healthy Diets ASAP (Australian Standardised Affordability and Price) method. By working out the real price of different diets, these standardised methods will help to determine whether the affordability of healthy food is a barrier to following a healthy diet. The project determined the real price of healthy and unhealthy diets to inform health and fiscal policy decisions. The new standardised methods will help to answer the key policy questions of what is the difference in price and affordability of healthy and current (unhealthy) diets, and how these would change under different policy scenarios. Production of data feeding into broader computer modelling systems to determine estimates of projected health impacts and costs under different fiscal policy scenarios. Lee A, Kane S and Lewis M, Are heathy diets really more expensive?, International congress of Obesity, World Obesity, Vancouver, Canada, 1-4 May 2016 (poster presentation). Lee A, Measuring the price of healthy and current diets, International Conference on Diet and Activity Methods, Brisbane September 2015. Lee A, Monitoring and benchmarking food price and affordability internationally; Third INFORMAS meeting, QUT Brisbane, September 2016. Lee A, Food Prices Symposium, ISBNPA Conference, Edinburgh June 2015 (con-convenor). Lee A, Measuring the cost of healthy diets, Food Prices Methods Symposium, ISBNPA Conference, Edinburgh June 2015. Lee A, Nutrition policy and the price of healthy food, Research Collaboration meeting, Australian China Centre for Public Health, Sun Yat Sen University, Guangzhou, PR China, 10-12 May 2015. National Healthy Diets ASAP Forum, to seek agreement on final methods for nationally standardised food price and affordability surveys. Brisbane, 10 March 2016. Prevention Centre news: Putting a price on food: is price a barrier to healthy eating?